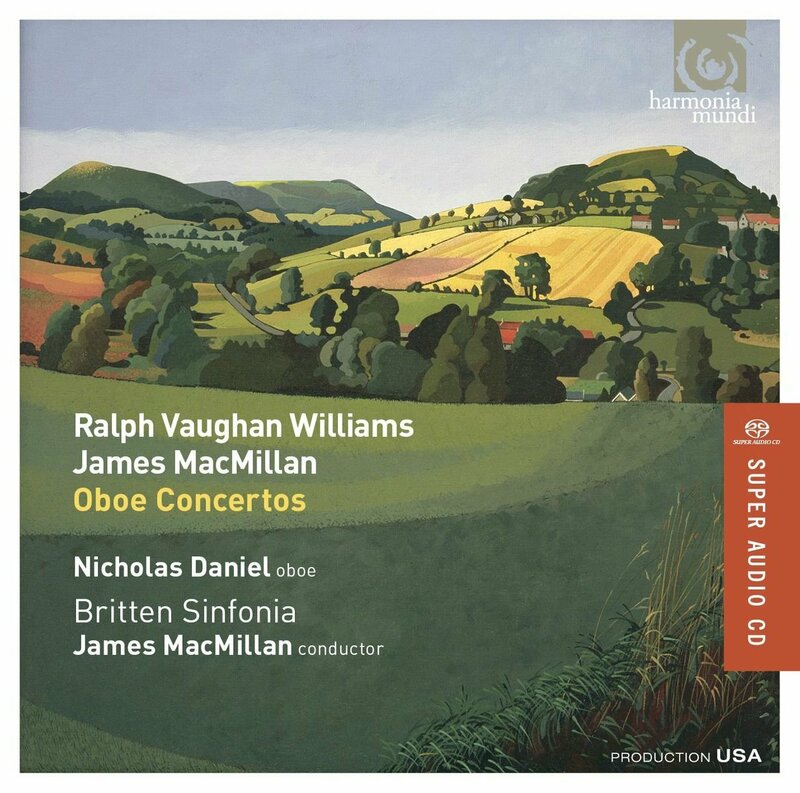 Nicholas Daniel teams up with the Britten Sinfonia and Harmonia Mundi to present the recorded premiere of the Oboe Concerto by the recently knighted Sir James MacMillan. He couples this with a much shorter piece by the composer, One, and another British oboe concerto, the well-loved Vaughan Williams. Completing a varied cross-section of styles is Britten’s Suite on English Folk Tunes (A Time There Was), his final completed orchestral work. MacMillan has written a bold Oboe Concerto, a substantial work lasting nearly 25 minutes that makes great technical demands on its soloist. It is a rewrite of an earlier piece for oboe and orchestra, In Angustiis, which responded to the horrors of 9/11. While the piece is essentially optimistic in tone, these thoughts can be felt in the second movement, essentially a lament, where the strings sigh painfully, and in a moment of deep thought that occurs towards the end of the first movement – in complete contrast to the jaunty, angular main material. Vaughan Williams’ concerto is a lovely piece, its dreamy first theme coloured with strings to evoke a picture of hazy sunshine. Completed in 1944, it is a largely positive work in the face of the Second World War, especially in the third movement, where a dance plays out between oboe and strings. Britten’s suite, as with so many of his orchestral works, is a model of economy, saying in fifteen minutes what many lesser composers would do in 25. It is extremely resourceful in its use of ten folk tunes, but it is also tinged with pain, the composer aware that he is in his last days – and this is felt in Daniel’s cor anglais solo in the tune Lord Melbourne. One, the second MacMillan piece here also shows his love for his home country, based on a single, arching tune based on the traditional song of Scotland and Ireland. Nicholas Daniel is one of our finest oboists, and although even he admits to difficulties in learning the part for the MacMillan his playing is absolutely superb. The energy of that work contrasts with the soulful Vaughan Williams, an affectionate performance where the slightly reduced forces of the Britten Sinfonia (in comparison to a full scale orchestra) mean more detail can be heard and enjoyed. Turning his hand to a conducting role, Daniel teases out Britten’s subtle affection for folk tunes through the relative darkness of illness. Yes – and how satisfying to listen to such a substantial contemporary piece for oboe, which could hardly have a better advocate than it does here. With contrasting styles of music this disc is an unrestricted pleasure, and is recommended for all fans of classical music from these shores. This entry was posted in On record and tagged Benjamin Britten, Britten Sinfonia, Harmonia Mundi, Nicholas Daniel, Ralph Vaughan Williams, Sir James MacMillan by arcanafm. Bookmark the permalink.